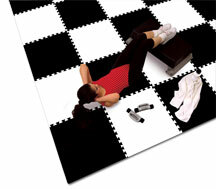 SoftFloor tiles come in 14 different colors and are easy to assemble in minutes. These floor tiles provide a soft and safe floor for a variety of environments, such as gyms, health clubs, home, and other facilities. Thickness: 5/8". Also available in 7/8", 1" and 1/2" sizes. 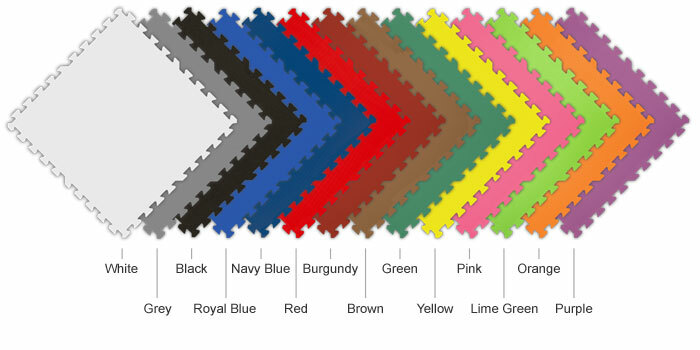 Colors: White, Gray, Black, Royal Blue, Navy Blue, Red, Burgundy, Brown, Green, Yellow, Pink, Lime Green, Orange and Purple. Availability: Most orders ship in 1-2 days after order approval. For large orders, if time is an issue, please call for a stock check. Travel time from the factory is 2-6 days to most locations - longer for Hawaii, Alaska and international orders. 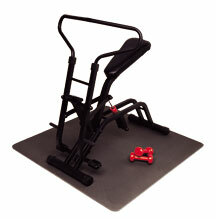 Master Carton: 25 pieces (100 sq ft) 26" x 26" x 15" - 32 lbs. Partial Carton: 1 piece (4 sq ft) 26" x 26" x .64" - 1.28 lbs . I.E: 10 piece (40 sq ft) 26" x 26" x 6.4" - 12.8 lbs. Location: Ships from the Chicago, IL factory.